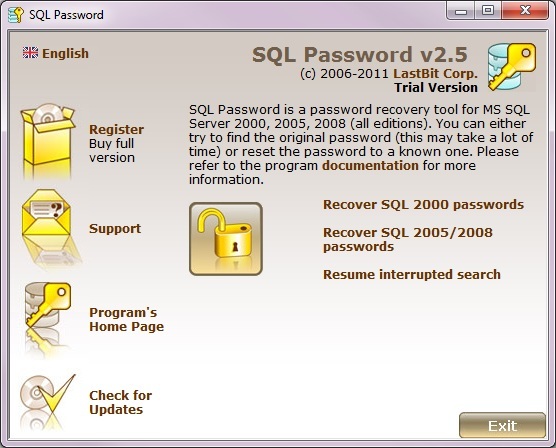 SQL Password is a password recovery tool for MS SQL Server 2000, 2005, 2005, 2008 (all editions). You can either try to find the original password (this may take a lot of time) or reset the password to a known one (this is instant but the original password will remain unknown). If you decide to find the original password, we recommend you to read the following article:Recover Passwords Using Universal Recovery Methods. Note that the recovery process may take a lot of time if the password is long. You can use our Password Calculator to estimate the recovery time. SQL Password is quite easy to use. - SQL Server may be configured in the "Windows Authentication" mode. In this case standard Windows security accounts are used and this program will not help you. SQL Password is able to recover passwords if SQL Server uses SQL authentication. - If you decide to reset the password to a known one, SQL Password will modify the master.mdf file to change the password. We HIGHLY RECOMMEND that you backup master.mdf first! SQL Password will prompt you to make a backup copy. Note that if your database is large, the backup process may take a lot of time and disk space. Nevertheless we recommend to create a backup copy. Note: SQL Password is included in Software Megapack (Business License). The Personal License of Software Megapack does not include SQL Password.